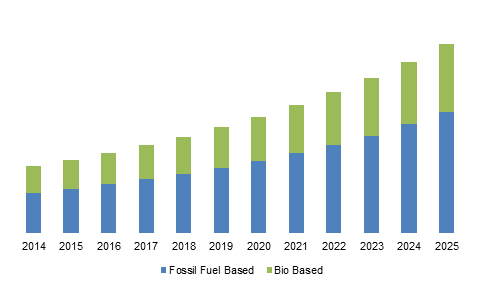 Bio-based and Synthetic Dimethyl Ether Market size valued at USD 8.24 billion in 2018 and will witness 8.5% CAGR during the forecast timespan. Dimethyl ether market has major applications in LPG blending as it is widely used in domestic cooking & heating to encourage a cleaner source of energy generation. It is also used as an aerosol propellant, raw material fuel and for industrial purposes. The rising greener fuels demand has been propelling the product demand for LPG blending. Furthermore, the product is extensively used as an aerosol propellant for wart removal in pharmaceuticals, as a hair spray in personal care and as an air freshener in home care. Product is used as a raw material fuel in specially designed ignition diesel engines owing to its higher cetane number that offers better ignition in compression engines. It is an alternative to diesel and is a cleaner source of energy saving the environment from harmful pollutants. Thus, increasing automobile sales, pressing need for a sustainable fuel substitute and increasing R&D initiatives from key players for developing DME compatible engines will boost industry growth by 2025. Dimethyl ether market for LPG blending is prominent as it has been extensively employed across domestic and household industry for heating and cooking applications. Blended LPG is a cleaner source of energy generation and henceforth has been thoroughly encouraged for domestic applications by government and regional bodies through strict environmental legislations. However, product is a fuel with no lubricity, traditional fuel delivery and fuel injection systems are not compatible with it. Due to which diesel engines need a fuel-tolerant injection system to operate on the product. These factors are likely to hamper the bio-based and synthetic dimethyl ether market growth in near future. Product is segmented based on raw material into fossil fuel and bio-based. Bio-based product is produced from dehydration of methanol whereas fossil fuel-based product is produced from dead remains of plants and animals. Fossil fuel-based dimethyl ether accounted nearly 85% in 2018 and shall witness prominent growth rate during the forecast timespan. The prime reason for massive fossil fuel-based DME share is the abundance availability of natural gas reserves beneath the earth surface which can be easily recoverable with evolving technology. LPG blending had the largest DME market share in 2018 and shall witness a significant demand in next few years. LPG blending has been encouraged primarily in Asia Pacific to reduce pollutants from the environment which are generated by unblended LPG applications in heating and cooking for domestic purpose. Government and regional regulatory bodies have formulated stringent environment laws to encourage LPG blending as it emits lesser pollutants in the environment. Aerosol propellants segment will witness tremendous growth in the coming years, expanding at a CAGR of more than 8% during forecast period. Above average segment growth is credited to its widespread applications across pharmaceutical, personal care, home care, paints & coatings industry, etc. Positive growth indicators for personal care, home care and paints & coatings industry in Europe will help to increase the product demand for aerosol propellant application over the forecast span. Moreover, sturdy pharmaceutical growth in North America will contribute to aerosol propellants bio-based and synthetic dimethyl ether market size by 2025. 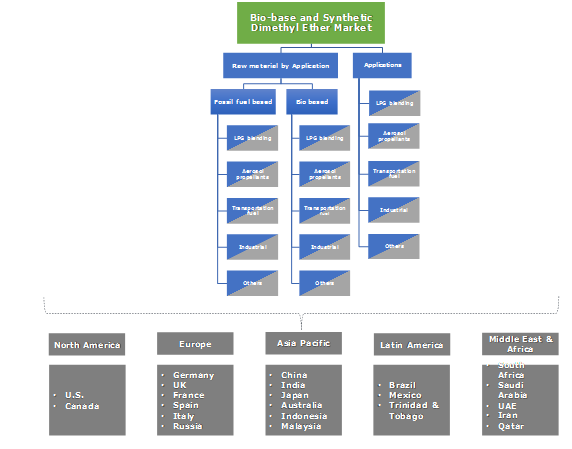 Global dimethyl ether market was led by Asia Pacific region in 2018 with a share of more than 80%. Rising trends for LPG blended with product for domestic cooking application in the APAC countries including China, India, Indonesia will propel the Asia Pacific bio-based and synthetic dimethyl ether (DME) market in the forecast period. Moreover, substantial initiatives by Indian government to displace kerosene by DME and the growing urbanization in the region also present brighter demand aspects for product in LPG blending. Europe was the second highest contributor in 2018. Product has been gaining wide acceptance as an alternative fuel for compression ignition engines in Europe, which will likely propel the regional dimethyl ether market share during the forecast period. North America was ranked 3rd in terms of volume & revenue in overall dimethyl ether market in 2018. 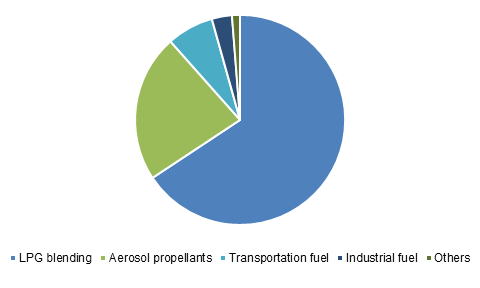 The vast product demand as aerosol propellant in the region will boost the market share in near future. Latin American countries will likely witness a slight rise in the product market over the forecast period, owing to the increasing product demand industrial applications in the region. Global dimethyl ether market is moderately competitive. Many international giants are operating in the industry. Major industry participants include China Energy Ltd., Akzo Nobel NV, Royal Dutch Shell, Korea Gas Corporation, Shenhua Ningxia Coal Industry Group, Mitsubishi Corporation, Oberon Fuels, Grillo-Werke AG and Guangdong JOVO Group. Companies operating in the industry are increasing their product line to gain the competitive advantage. For instance, In February 2014, AkzoNobel introduced a new product named Demeon D which has widespread applications in the personal care industry to further expand its portfolio to attain competitive advantage in the market. Dimethyl ether is also known as methoxymethane, it is eco-friendly and cost-effective in nature and is considered as an effective alternate transportation fuel for diesel. It is a colorless gas and used as aerosol propellant in chemical industries. It is clean source of energy which can be fabricated from natural gas. Product is gaseous at normal pressure and temperature and changes to liquid with increased pressure and cooling. Liquification of product makes it easy for storage and transportation. Bio-based product is experiencing an increasing demand from various application segments. Bio-based product is manufactured using renewable materials including biomass, waste and agricultural products.